Wide range of services for heavy vehicles, as well as special body construction. Welcome to a full-service house, where you will find all the heavy equipment services under one roof. Our skilled mechanics and the latest technology are at your disposal to ensure high-quality service and satisfied end results. 17.12.2015 We wish You Merry Christmas and a Happy New Year! Our workshop will be closed during 24th-27th December. 19.01.2015 Special body building - on the tab are added images, which can be found at the link on the page, please look! 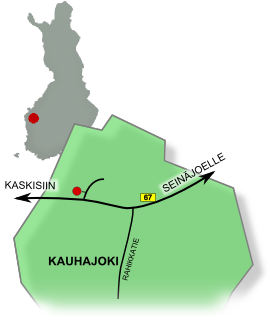 Our office is located on highway 67, in Kauhajoki Aronkylä. We have a large yard, a garage workshop, office space, as well as full-height washing line operating with tokens. In the industrial area of Aronkylä also operates IKH, Älvsbytalo, as well as a number of other well-known companies. For the wellbeing of your vehicle, in addition to our responsible and professional staff are also the highest quality brands on the market. We also have Finland's only full-height vehicle washing line that operates with tokens. If you want to join our mailing list, please leave your contact details via the contact form. We will send by e-mail or SMS information about current offers so that you will be among the first to receive the data!